I have lived all but a few of my 52 years right here in the Spokane Valley. In fact, I have lived 23 of those years at 11518 East Alki, the first 7 of my life and the last 16, but that is another story. The point is I am a Spokane Valley lifer and until today I have never come close to any kind of claim to fame. I have never seen even one of the 15 minutes of fame that Andy Warhol said we should all bask in at one point in our lives. But as the fickle finger of fate would have it, today I at least had perhaps an entire 6 seconds of glory on the local evening news. The funny part to me is that those few moments and how they came to transpire have given me a story that I undoubtedly will retell with heaping relish for the rest of my life. I still can’t believe how winding and surreal the story line was from the shocking moment I shot myself in the leg with my framing gun last Friday to seeing myself on the 6 o’ clock local Monday night news. In all the 35 or so years that I have wielded such dangerous tool/weapons as worm-drive skil saws and pneumatic nail guns, I have never delivered unto my personage a serious wound. I have always accredited that to a vivid imagination that has always fearfully invisioned the blade of my saw or the nail of my gun ripping or piercing my soft, sensitive tissue far more easily than the wood I had directed my tools toward. So when I shot myself with a 3 1/4″ nail Friday morning as I reached down to grab the gun I had squeezed between my legs, I refused to believe that I could have crippled myself even though the nail buried into the side of my right knee. There wasn’t that much pain and so I was hopeful as I hobbled to the van and made my son grasp the head of the nail with pliers and give a hard and fast tug. That is the moment of truth with a nail imbedded in a body part, if the nail comes hard then it is buried in something hard like bone. If it comes quick and easy then it drove into soft tissue. We were both relieved when it came out like it had been buried in soft butter. In fact, we went back to work and worked another hour until lunch break. I did fine that first hour and was going strong until I got out of the van and headed across the Subway parking lot. In the 7 minute drive from the job to the fast food joint, my leg siezed up and hurt like the dickens. We were planning on staying and eating at Subway but I did not want sit any more than I had to and so we headed back and ate on the way. I had a steep roof to sheet that afternoon and to be honest, every step I took on that roof as pulled up the 4×8 sheets of plywood and then threw them down into place hurt pretty good. It never crossed my mind to stop and I give my father credit for that. I worked with him for many years and I have never in all my years in constructtion seen a tougher man. I will never forget as a young boy seeing him suffer a wound in a motor cycle accident that ripped into his legged so severly that it still makes my hiney pucker to this day. He just winced and never said a word. Another time I saw him bounced a chain saw off his thigh, wrap a rag around and went right on working. My glancing nail wound was nothing compared to that and so I gladly taught my son a lesson in toughness while completing the job we set out to finish that day. But by the time we went home, my leg was hurting. It was hurting in the back of my calf quite a ways from the wound and so that concerned me a little. When I got up Saturday morning, the calf was really tender. I had been asked by a friend to walk in the 3-mile ALS Walk at Maribeau Park and for some reason I thought would help the stiffness. Elaine was sleeping when I left, and so it would be hours later before she told me how dumb she thought I was. I limped a bit but it was not that bad. Somewhere about this time I brought the power of facebook into my unusual weekend. I love facebook and am fascinated by its immence power. I contend that facebook is the most important developement to come along since the internet and it is debatable which is more significant. I posted a question about why the back of my calf would hurt when I shot myself in the side of the knee. I have a lot of friends, and the mother hens came clucking out, warning me that my life could be in jeopardy by a blood cot. I do not mean to belittle them here because I was very moved by them scurrying out of the woodwork so to speak, considering I had never heard from most of them before. It was just a shot in the dark but it quickly went out of my control as my concerned friends threatened to drive over and kidnap me down to the emergency room. Not wanting to be branded a fool on facebook by this flock of mother hens and risk never being able to seek their guidence again, I beleaguredly made my way into the Rockford Emergency Cinic Sunday morning, only to be told that they could not perform an ultrasound on my leg to determine if I had a clot and so I would have to go to the Vally Hospital Emergency room. Losing my momentum towards this end, I stopped at the house to tell Elaine how my efforts had been thwarted and I was being redirected to the hospital emergency room. That is when she first told me that our flimsy insurance policy had a $1,000 deductable when it came to the emergency room. Just two years before we had spent that amount at the Valley Hospital emergency room to find out that our ailing daughter did not have appendicitous and would be just fine. That took the well-meaning wind right out of my sails and grounded me and my ailing leg right there. I would risk it until the next morning when I could go into our regular doctor’s office when we had better coverage. Besides, by this time I was beginning to abandon the blood clot possibility which I had never bought into in the first place. But I truly respect each of my motherly hen friends and did not want to suffer any admonishment from a single one of them and so I headed out bright and early this morning with instructions from my major mother hen, Elaine, to call our doctor at 7 and schedule an emergency appointment which she assured me the always kept room open for on their daily schedule. I go out for coffee just about every morning to Burger King or McDonald’s but this morning I went for the Jack in the Box at Pines and Mission because it is right on the way to our doctor’s office. Remember that I am a blogger-slash-internet goofball and so I looked about the dining room and was delighted to find a corner table with a near by outlet that I could plug my laptop into. So I plugged in the laptop, dialed in the smart phone to the net, layed out breakfast for a picture, ( I shoot before every meal in public like a born-again prays before every meal, always thinking of a possible blog). Then I looked up over my laptop, through a 10″ gap between the posters plastered on the windows in front of me. It was at that moment that I saw a foaming head of white smoke arise from a building a thousand yards beyond Jack’s window posters. Within seconds, before the white head of smoke had risen 30 feet above the building’s rooftop, a rush of sinister black smoke shot up past the slower light smoke and I grabbed my smart phone and headed to out the door to further investigate, knowing that there was a building going down in a blaze. Having seen that first smoke shoot up and then going outside and not hearing a single siren, I knew that I was seeing this all unfold from the very beginning, even before the first 911 call. In fact, as I waited on the south side of Mission to cross east on Pines, I saw a cop pull up in the southbound lane of Pines on the far west side preparing to go west down Mission but a pedestrian tapped on his window and pointed to the burning building. He looked and saw the flames, hit his lights and turned across 7 lanes of traffic and shot down Mission and arrived at the scene before the first siren sounded. In the meantime, I impatientley waited for my side of the light to allow me passage across Pines. I remember thinking I had the chance of getting one of the videos you see on You Tube or Greatest Home Videos. I bought an Android smart phone to always have that capabillity at all times. And this morning it was about to pay off big time. 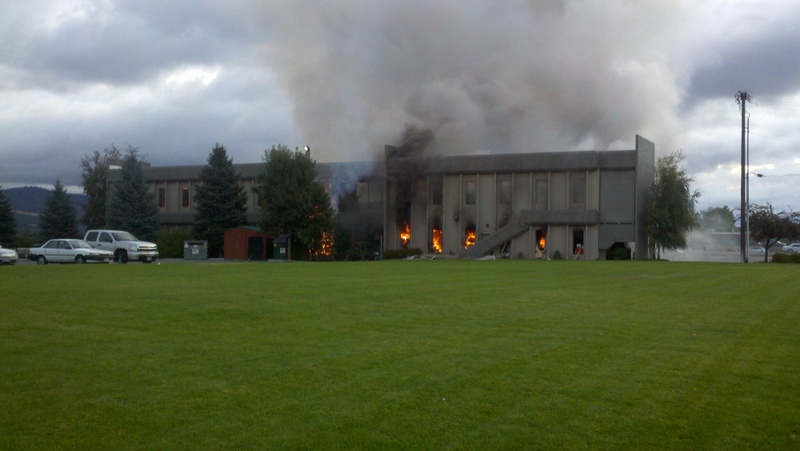 This my doctor's building going up in flames. Click here to see the video. It appeared on khq and krem news and both stations came by my house to interview me. While the interviews took at least 10 minutes apiece to film, I appeared for one 6-second sentence in each broadcast. More important to me was my video which was the star of the evening news on both stations in their lead story. (the firey video scene in this news feature was mine. BTW- I went back to the Rockwood Clinic that afternoon and got a tetnis shot and a clean bill of health. On August 9th 1982 I took Elaine Clark out for the first time. 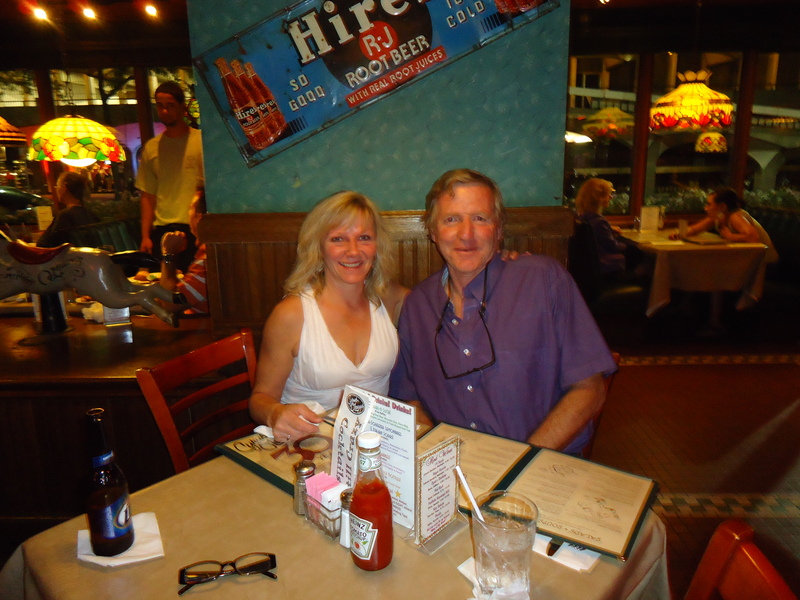 As a timid, non-ladies man, I felt that I could use as much help as I could get and so I chose Cyrus O’Leary’s for its great food and exciting atmosphere. This was a night of paramount importance to me, as I had been attracted to Elaine since we were kids. The 4-year-age difference between us, which seemed a huge chasm growing up, magically had vanished that summer when I came home from college to find the pretty little girl was a beautiful 18-year-old young lady, more attractive to me than ever. After a few months of shyly trying to get her attention as we separately attended dozens of functions and get-togethers at the church we had both grown up in, I finally built up enough courage to ask her out and to my enormous relief and unbearable excitement, she agreed. Sitting across the table from each other on that hot summer night with the bustling activity of the packed Cyrus O’Leary’s swirling unnoticed around us, we fell deeply in love right then and right there. I know that for a fact because from that moment on we were as inseparable as smoke from fire. Later as we moved from our amorous meal, we decsended deeper into our own world as we held each other’s hand for the first time and walked down to the billowing, misty Falls and eventually found a secluded dark spot we deemed worthy of our first kiss. Later that evening, after we finally said good-night on her front porch following a barrage of moist kisses and smothering hugs, Elaine went inside and told her sister that she was going to marry me. Nine months later her prediction came true when I got down on one knee and proposed in her living room. She said yes without hesitating and then asked when. I said I thought the next day would work fine, if she didn’t mind. We eloped the following day, April 26th, at the Wedding Chapel in Couer D’ Alene. Flash forward three years to find our marriage on the rocks. Elaine thought she no longer loved me and moved out June 12th, 1985; by far the worst night of my life. Though she was gone, I could not let go of her and I fought to win her back with everything I had. I bought and devoured the best book ever written in the history of mankind called “How to Win Back Your Lost Love.” It was my gospel as I followed every piece of advice it had to offer, losing weight,getting a haircut, buying a new wardrobe, listening to every word I was lucky enough to get her to say to me as though her every word was the most important thing I had ever heard in my life. To this day I thank God for leading me to that book that taught me how to get back the love that I had squandered. It taught me better than four years in college that you can find the answer to any problem if you can just find the right book. She came home one month later and so to celebrate and to try to rekindle our lost romance, I once again sought the help of Cyrus. It was another hot summer night and like three years before, the place was packed and we were obliged to put our name on the waiting list and then patiently do just that, wait. Cyrus has a lot tables and we were not picky that night, any table in a storm. With my typical male trait of not paying attention to romantic detail, it was momentarily lost on me as the hostess finally came and sat us at the same table we had three years before that first night we fell in love. It was not lost on Elaine, however, as she burst into tears and melted into the realization that we were meant to be. Cyrus had confirmed it. That was 26 years and four beautiful babies ago, the youngest of whom is now 16. 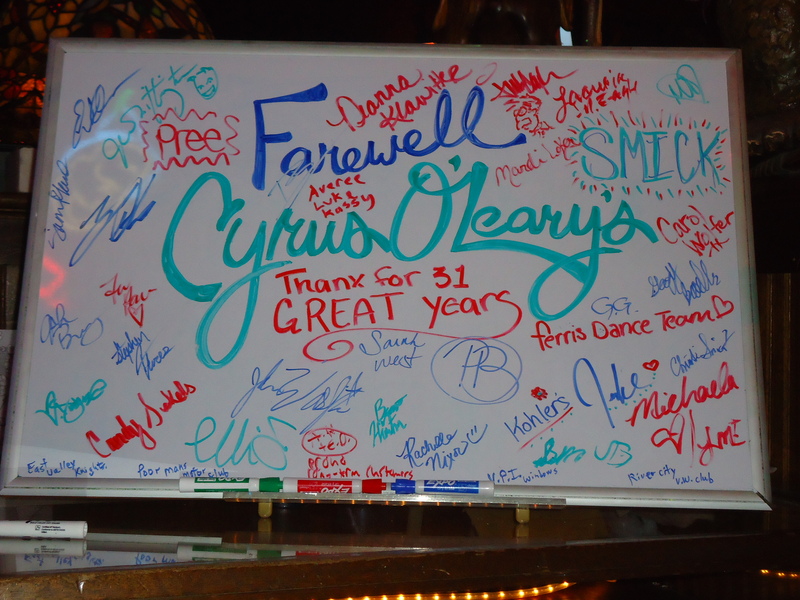 How could we not go back for one last date when we heard Cyrus would be gone forever after Sunday, September 11, 2011? We went for one last hot, romantic date on Saturday, their last night in business. I thank God and Cyrus, one of the many vessels He used to help Elaine and I come together, then come back together and then stay together forever. Most of all, on that last of many, many romantic nights that Elaine and I shared together at Cyrus O’Leary’s over the years, I was reminded of and thankful for beyond words that I had been given the extraordinary blessing of being as strongly attracted to and in love with my life’s love as I was on that first date 29 years before. And so now with God before us and Cyrus behind us, we just thank them both for taking such good care of us. The last supper at our table.We thank God and his helper Cyrus. I am a bit of a public recluse in that I enjoy sitting in public places by myself either reading the paper or doing something on my computor like right now as I sit at the Rocket Bakery composing this note. On weekends I normally have a couple of hours to burn before my late-rising family gets up and at ’em and so it works out best when I leave the premises and let things remain quiet in the house. I used to do McDonald’s because they had great WI FI and I got an added bonus one day when the cashier apparently had bad eyesight and assumed I was an old geezer and gave me the senior coffee discount. Offended at first, I took it on the chin and then always asked for it after that since they had the nerve to assume I was 55 when I was only 52. But lately since I get WI FI on my Droid, I have the freedom of going anywhere and so I tried out Burger King and I’ll be doggoned if the cashier didn’t mistake me for an old duffer there as well and insisted on giving me the senior coffee discount. Though the truth stings, I am now a Burger King regular since their senior coffee is an even 50 cents with tax. So this morning with my family in bed and time on my hands, I headed over to the Argonne McDonald’s for old time’s sake. It is really a nice place to sit down with a cup of coffee and enjoy a little public privacy.They have some cozy booth tables on the west side by the playland. 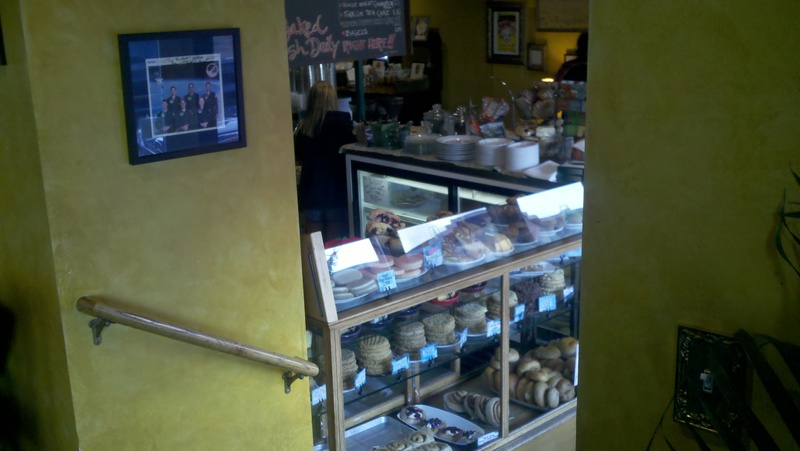 But then I changed my mind mid-stream and headed down the road a little further to try out The Rocket Bakery. Thinking about blogging Valley coffee shops, I have been perusing a few lately. So far this place has by far the best decor and atmosphere. Though I have been in here many times to fetch Elaine her beloved No-bake cookies, I had not noticed that they had enlarged the upper sitting area and added a fireplace. Ernest Hemingway could have written The Sun Also Rises while sipping coffee in a setting such as this. The antique wooden tables along the walls all have reading lamps and convenient plug ins nearby. Unlike all the other coffee shop/delis that I have been to so far, the Rocket has carpeting and not a hard surface floor which makes it much warmer. Another thing The Rocket in the Valley has going for it is Millwood. 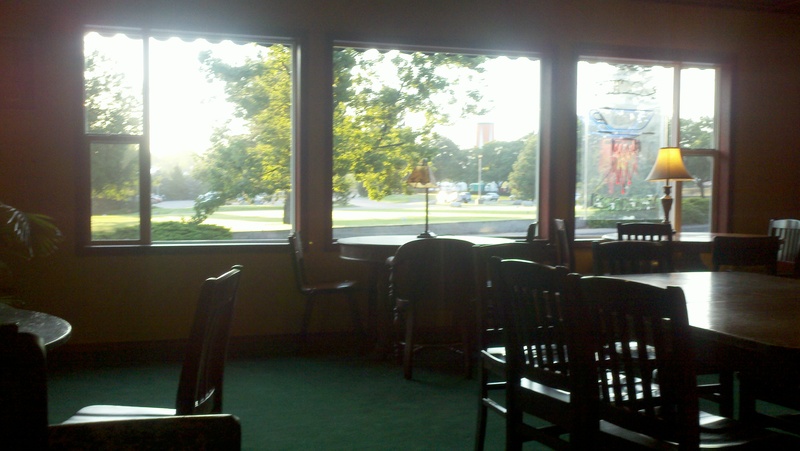 I doubt if there is another coffee shop with a nicer view across the street. Three large picture windows in the sitting area look out this early morning to a well trimmed lawn glistening with dew as a dozen or so seagulls wander around doing whatever seagulls do. The picturesque deciduous trees that Millwood is bless with, as opposed to the coniferous Pines the rest of the Valley endures, convenientley hide the paper mill from sight and shade the Rocket from the glare of the early morning sun. I am not a connoisseur of coffee drinks or lattes and frappes and such. In fact I don’t know what most of them are. I just like a good cup of joe which the Rocket has. But this is where the Rocket sputters for me. First, they charge me $1.50 for a 12 oz. cup which is the most that I have been charged so far in my survey of Valley coffee houses and then they charged me 38 cents for a refill. I didn’t know that was even legal. At any rate, I know it is not ethical. I guess it costs a few cents more to be able to enjoy such a rich setting. Lucky for the Rocket that I do not live in Northwood, where they have plenty of well heeled customers I’m sure, because I would shoot past this place for my regular morning coffee and hit the old Burger King. But if I did live in the vicinity, I would fatten Elaine up by frequently picking up her favorite treat which I am about to do now as I head out the door to go home and roust my sleepy little girl out of bed by wafting a No-bake cookie under her little nose. The Sun also rises at The Rocket, it just doesn't get to blind the customers as the friendly trees across the street kindly shade the shop from its shine. They got some mighty tempting morsels at this place. One of these tasty little hummers is about to fly out the door.